Forums › Announcements › Version 4.3.7 is out! This topic contains 14 replies, has 11 voices, and was last updated by MiST 3 months, 3 weeks ago. We just released Bootstrap Studio 4.3.7 with the long awaited auto backup feature. The app will now periodically take snapshots of your design and save them to your hard drive, minimizing the chance of lost work. You can control the frequency of backups, how many copies to keep per design and how long to keep them. Looking forward to your feedback! The next release is going to bring favicons, SEO and progressive web app functionality. Thanks for all the updates! Most especially for the copying of multiple files between designs! I use comments to recognize what block is for what, but I don’t want to export “all” those as comments as that would be a ton of comments that wouldn’t be needed. I prefer to use comments for only certain things. Will we ever get the ability to add comments manually? This update is a start and will be good for many people I’m sure, but many of us would like to do them ourselves. Thank you for this update – Appreciate the Labels export and the export progress! @jo we decided to leave comments for the next release in order to ship auto backup sooner, but they’re coming. For both HTML and CSS. This update is really useful ! thanks for supporting comments on export. I’ve a small suggestion regarding the autobackup : i’ve had to change the directory where they are saved, but after the change, the already made backups are not moved from the older to the selected directory. I Think it is better to move the files to the directory selected by the user. 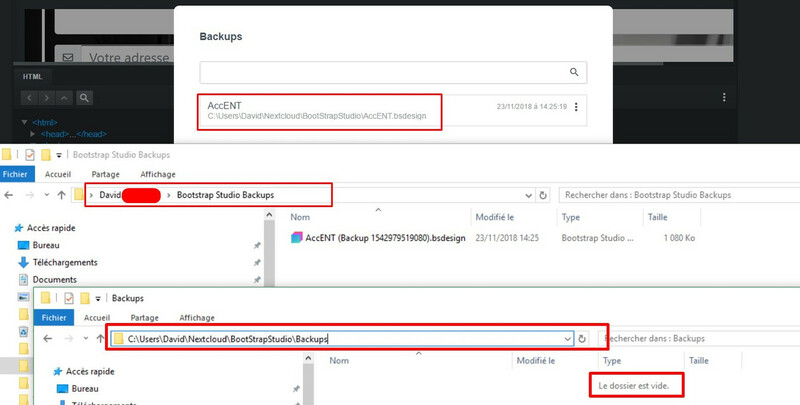 @larsene, the path displayed in the Backups dialog is actually that of the original design and not of the backup, as that would make it easier to distinguish between backups. For example if you have two designs with the same name, you can look for backups of one of them by typing in its whole path. Hope this clears up any confusion that may have arisen. As for the directory, unfortunately for technical reasons backups can’t be moved. Indeed, this is a great update to BootStrap Studio ! and many thanks for the ability to export the comments. Really, really useful ! Question: are the backup settings site specific or application specific? In other words, does each site get its own backup location, frequency, etc? Also, shouldn’t there be an option to never delete backups? If it is true for this new version than provide us with a download link! @r_oberti : you just have to launch your BootStrap Studio, then it will detect the update and install it. No need of install files. You have received the download link when you have purchased BSS. This word “Buy today and get our premium templates for free! ” and where I can find. The only templates that come bundled are the same ones found on startbootstrap website.